I fumbled with the key, turning it over and over again in the lock. It felt like it had released but the door still would not budge. Getting frustrated, I passed the keys to Kevin and asked him to give it a try. It was after one o’clock in the morning and I assumed I was just too tired to figure it out. 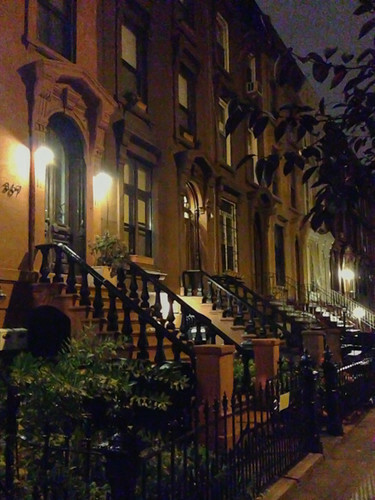 We were outside of the brownstone apartment in Brooklyn we had rented on the vacation rental site, Airbnb. My sister and her husband had come out from Pennsylvania and the four of us had just gotten home from having dinner at a late night pizzeria. That was when I remembered the conversation I’d had with our Airbnb host that morning when she gave me the keys. “Only the deadbolt will be locked,” she said. We lock the knob lock at home and I realized we must have accidentally done the same when we had left for dinner. 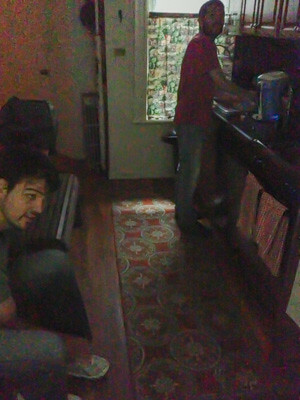 The lovely apartment we rented on Airbnb was a little less lovely when we got locked out in the middle of the night. I replayed the conversation in my head. The host had said that when we arrived, only the deadbolt would be locked. She hadn’t said, “don’t lock the doorknob lock”. That’s an important distinction. But it didn’t matter now, we were locked out. The host has an apartment adjacent to ours and behind the locked door, so Kevin tried knocking, gently at first and then louder. I pulled out my phone and dialed her number. No answer. I got locked out of an Airbnb apartment in Paris earlier this year. I had to call the emergency contact we were given when the key hadn’t worked in the finicky, old lock. Luckily, she answered our call right away and was on her way to bring me a spare key when I finally managed to get it open. This time we weren’t so lucky. In desperation, we called our friend, C., who was also in town from California. He and his wife had rented another Airbnb apartment just two blocks away. I hated the idea of waking them up and crashing at his place (I knew his host would be horrified if she found us there! ), but we didn’t know what to do. Groggy and half asleep, he told us to come over. The four of us sprawled out on the kitchen floor of the tiny apartment. My fear was realized when his host woke up in the middle of the night and came into the kitchen nearly tripping over my brother-in-law. She angrily exclaimed, “why are you sleeping on the floor!” I jumped up to explain that we were friends of theirs and that we had been locked out of our own Airbnb apartment. She softened and apologized, and brought us some pillows from the couch and some sheets to cover up with. The small kitchen floor we slept on. We finally got in touch with our host at about 7:30 that morning, after I’d called Airbnb’s customer support to ask for their help. Our host admitted she hadn’t clearly communicated that we weren’t supposed to lock the knob lock and that she hadn’t heard our calls come in, and she refunded our money for the night. Still, it didn’t make up for the anxiety and the trip-killing night with no sleep. It was stressful experience, but it hasn’t turned us off of using apartment rental sites. Renting an apartment in a real residential neighborhood is a great way to experience a community as local residents do, but there are some lessons we’ve learned for next time. 1. Ask for two emergency contacts who have keys to the house. Even if the host is in town, as in our case, you need to have a backup person to call if they are not able to answer their phone. 2. Understand the cancellation policy. Airbnb allows hosts to choose from five cancellation policies ranging from flexible policies (where you will receive a refund up to a day before arriving) to hosts who require 30 days notice of cancellations. If you think it is possible you will have a change of plans, look for hosts who offer more flexible policies. Emily told me the story of how her brother had booked an apartment on Airbnb and the host cancelled the reservation just a few days before he arrived. Because it was a busy holiday weekend, he had trouble finding a place to stay at this last minute. She suggested one way of protecting yourself in this situation–reserving a room at a local hotel that allows 24 hour cancellations, so that you have a backup place to stay if this happens to you. And if you cancel in advance and have a problem at the last minute, at least you will know of a local hotel to call that may have a vacancy for you. Mara told us that though she is often tempted by new apartment listings with stunning photos but no reviews, she always passes them up for listings that have proven themselves with multiple positive reviews. I do the same thing as I feel it’s a way of reducing the risk by going with a proven site. EIT reader, Anna cautioned that user-listed reviews can be faked by dishonest landlords. For this reason, I tend to look for listings with lots of longer and more detailed reviews that are harder to falsify. If all of the reviews are pretty generic (e.g. “great place, nice host!”), you probably want to look elsewhere. As we suggested in our article about choosing a housesitter, don’t feel bad about researching the host and even asking to contact references. Some hosts will offer links to their social media profiles, their websites, outline where they work, and other information that helps to show they are a real, verifiable person. Do your due diligence to whatever extent makes you feel comfortable. A couple who housesat for us recently told us a pretty shocking story. Just prior to coming to stay at our place, they had shown up at a house where they had agreed to housesit. Though the homeowner didn’t include any photos of the house in their listing, the description looked good, and the homeowner was very nice when they spoke on the phone so the housesitter agreed to the arrangement, sight unseen. When they showed up at the house they found the place to be filthy — a full-fledged hoarder situation. Though she felt guilty leaving them at the last-minute, she said that it didn’t feel comfortable staying there and declined the assignment. I always look for listings that have clear photos of every livable room in the unit. If there is one missing (bathroom, kitchen, etc) email the host and ask for one before booking so that you know what to expect. If the condition of the unit is vastly different from the photos on arrival, then you have every right to back out if you don’t feel comfortable. Want to give Airbnb a try? Click here to get $20 off your first stay! What are your tips for protecting yourself when using AirBnb or vacation rental services? What a nightmare situation you had in NY! So glad that you had friends you could crash with and that their host was so understanding about the situation. We have only rented an apartment once on our travels thus far, when we were really looking for some downtime. It was really nice to be able to stretch out and we loved the place we rented, though we did have some snafus along the way too. The biggest one was that our host’s landlord had an issue with her rent payment and kept trying to get us to pay what was owed; thankfully we were able to get in touch with our host and she was able to take care of it remotely! This happened the first day we arrived, and we were really worried we had walked into some kind of scam. Thankfully it resolved itself! Steph, we were pretty lucky to have someone to call and lucky our friend’s host didn’t kick us out (I wrote to Airbnb to tell them how grateful we were that she helped us out and to their credit, they sent her a $50 restaurant gift certificate that she was excited to receive). I am still irked that the company kept me on hold for about 20 minutes before answering when I called their “urgent support line”. Oh well, lessons learned. And what a awful situation you guys had! You’re lucky that the landlord didn’t kick you guys out, I’ve heard that that’s a risk when people sublet without asking their permission! So glad it worked out, especially for longer stays, apartment rentals are a welcome respite from the constant cycle of packing and unpacking. Why didn’t you guys come over to my penthouse in manhattan? Hehe Bad joke. I’m glad that at least you were warm for the night. What part of Brooklyn was this? It looks like where I used to live. It was in the Bedford-Stuyvesant area, where did you live? Yikes! What a nightmare and it was really fortunate that you had someplace to go. I just finished a trip to NYC where I used AirBnB. I had no backup option so I don’t know what I would have done. Great tips – I’ll keep them in mind for next time. Glad to hear it all worked out and glad you appreciate the tips! We have used AirBNB a number of times before and were fine, but it’s definitely something I’ll think about for next time. We’ve Airbnbed four times; the first we took a chance on a new host (and they on us as it was our first time using it ourselves) and it was AMAZING. We had a similar exp. in NYC where the host left the keys but they must have left the wrong ones as we couldn’t get in. Luckily they lived on the ground floor so I just called them and they came up. I had been debating which of their rooms to rent (they have Airbnb rooms in a few different buildings in the area) and decided to go with the room in the building where they lived in case there were any issues. Good choice as it turned out! It’s great that you had someone you knew in the city, or that could’ve been much more stressful. Mine too, Esther! It’s easy to dress up the bedroom and living room to make it more photogenic with new bed linens and curtains, but harder to dress up the bathroom and kitchen. If they don’t provide good pictures of those rooms (or won’t email me one) I’d pass. Thank you so much for sharing your story! I’m so glad you were able to get in touch with them. Before this happened I may have been more inclined to go with the unit in one of the outlying buildings but now I’d certainly choose like you — the closer to the landlord the better!